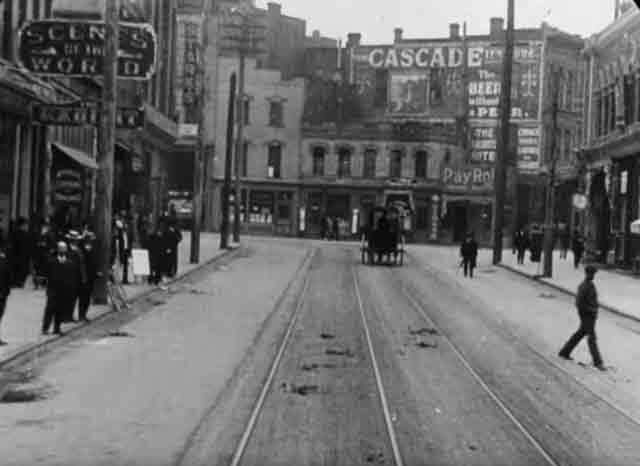 In this scene, the camera is traveling east along Hastings St. at Hamilton St. approaching the intersection of Cambie Street. The same scene today. 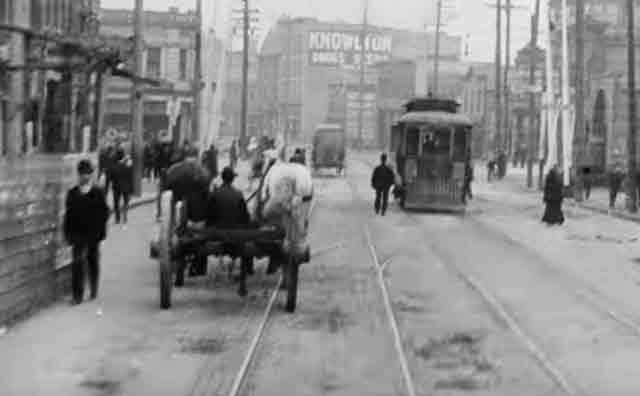 The streetcar tracks are long gone, but the general layout of streets is the same. Victory Square would be built in that open area on the right about a decade after this film was made - it was the site of the old courthouse. 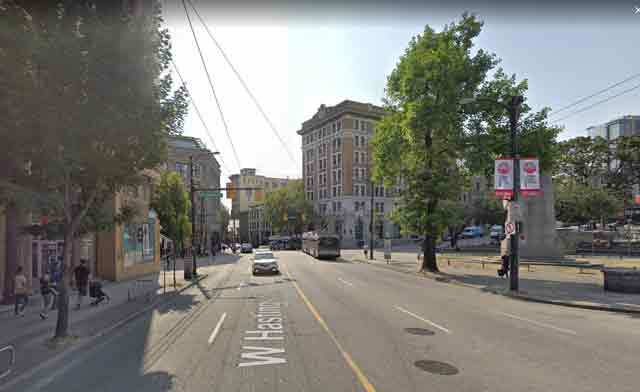 There are some trees in Victory Square that were planted in 1897 so they would have been visible had the camera turned to the right as it passed the Square. 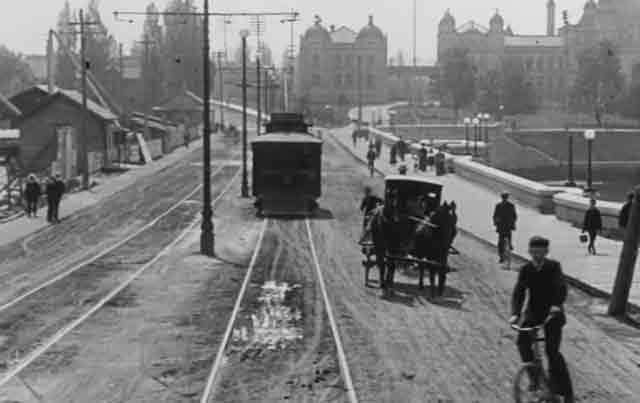 I love old films from eras that are long gone and that show a completely different world - even though it occupies the same space we all are familiar with today. I previously have posted films from such times in 1906 San Francisco, Hollywood in 1931, and New York in 1939, among other posts. 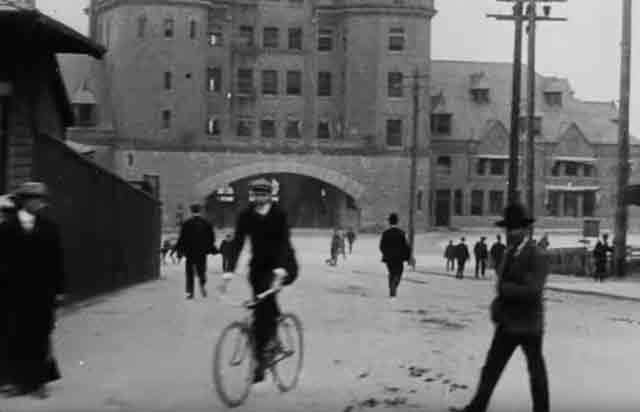 This is a film from May 1907 in Vancouver, British Columbia, Canada. Aside from the "Scenes of the World" sign on the left, the "Cascade Beer" sign on the right also is interesting. It reads "Cascade - The Beer without a Peer." on the wall. 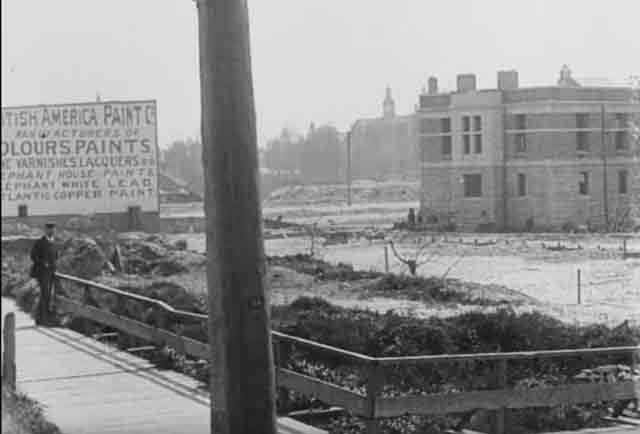 This film was taken by Mr. William H. Harbeck, for Hales Tours of Portland for their "Scenes of the World" series.﻿ That's his office on the left in the above photograph. It would be like you going outside of your place of work and filming as you ride around the block. However, the point is that nobody else was doing this at the time. Harbeck, born in Toledo, Ohio in 1866 (maybe 1863), now is perhaps best remembered as being a victim of the Titanic in April 1912. Harbeck was a veteran filmmaker - to the extent that was possible at the dawn of the film age - who had earned his reputation filming the aftermath of the 1906 San Francisco earthquake. 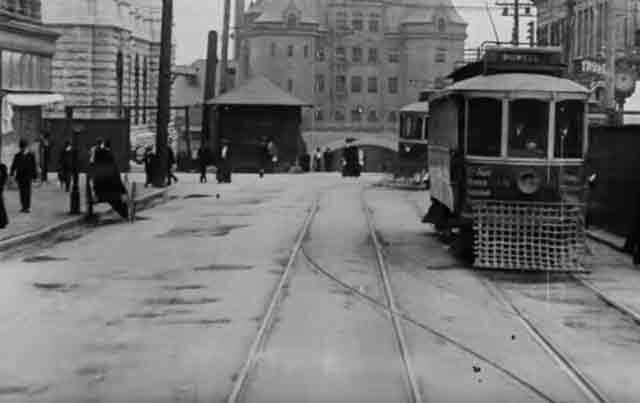 I have posted a film of San Francisco right before the earthquake, but that was taken by one of Harbeck's competitors. Harbeck just happened to be in San Francisco with his film equipment right after the equipment, which is why he was able to film the city's ruins from a cable car being pushed down the street. Harbeck had worked for the Selig Polyscope Company and was a member of the Moving Picture and Projecting Machine Operators Union. The Canadian Pacific Railway's Department of Colonisation then hired Harbeck to "put Western Canada on the motion picture screen in a scenic, industrial, and comic form." 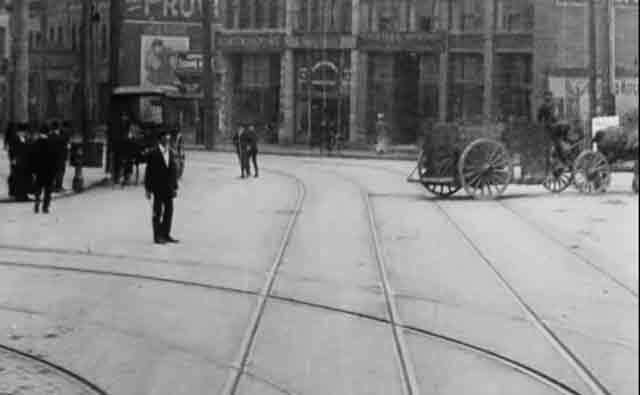 This is one of Harbeck's 13 single-reeler films for the railway. It's perhaps ironic in a sense that there aren't any railroad tracks in this film, but that wasn't the point of the series - it was to attract people (primarily rich Europeans) to buy railroad tickets to see western Canada. The railway sent Harbeck to Paris to study with filmmaker Leon Gaumont. He sailed for Europe in February 1912. Harbeck was returning to Canada on the Titanic, having boarded at Southampton. In fact, it is rumored that Harbeck was going to film the Titanic during his passage. He had two motion picture cameras with him on the Titanic and had 100,000 feet of motion picture films. It is not beyond the realm of possibility that Harbeck did some filming on the Titanic, and there are rumors that some films were screened on the ship before it went down. Harbeck's wife, Catherine, was on the Titanic. She claimed Harbeck's body - one of the few that were found and retrieved - and buried it in Woodlawn Cemetery in Toledo. Mrs. Harbeck passed away in 1940. As for this film, it speaks for itself, but I will make a few personal observations. 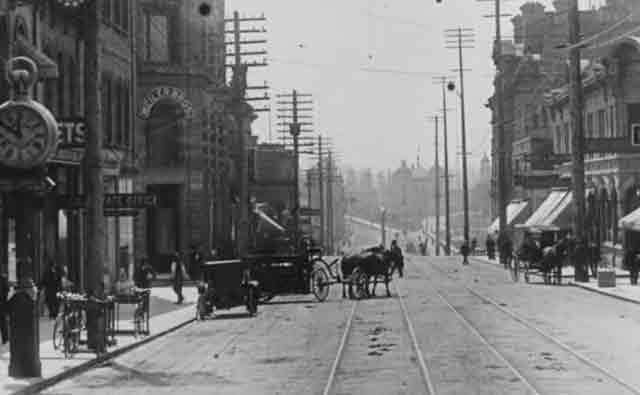 Obviously, Vancouver is a fairly well-developed city in 1906. It is full of trolleys and is very built-up. 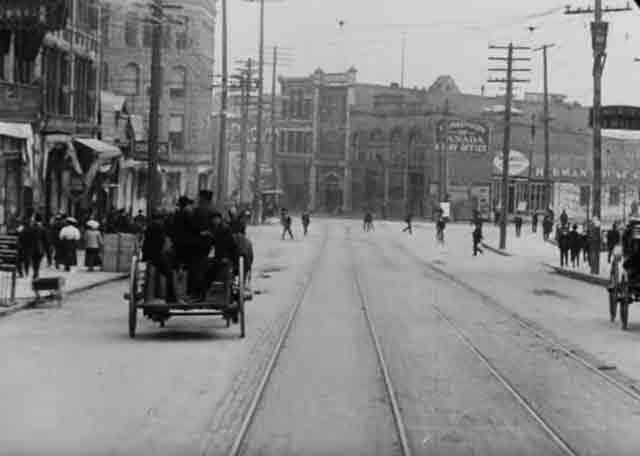 There aren't any cars, unlike in San Francisco and New York at the time, which is due to the fact that those cities were unusual for the time, not Vancouver. Thus, there are many horses and wagons and lots of manure in the streets. Elephant White lead paint is popular. Everybody wears black and it is a grim-looking place, but that is partly a function of the film - Harbeck undoubtedly chose a bright and sunny day to film. The people of the time would have felt that wearing widow's weeds every day was perfectly proper.